There are several references out there that people need to be aware of so they can check them BEFORE requesting a decal design and 90% of the requested designs already exist. www.FineClonier.com - All designs can be downloaded for PERSONAL USE only! There is a HUGE resource of well over 700 designs. www.minifigcustomizationnetwork.com/minifigcustoms - Many figures shown here include the decal design, which can be downloaded for PERSONAL USE only! Many hundred designs! If I missed any references, please PM them to me and I will add them to this list. Give creation a chance, try making your own design before asking for one to be made!! This forum is not for requesting designs specifically from me, but for requesting designs from the community at whole. So please if you enjoy designing decals, jump in and create all and any. What exactly are you wanting. There are several things in each image. Each could take a bit of time. I am looking for a face decal for Christopher Lee. I don't want to take a LEGO Vampire head, it is so white. Has anyone released a Astromech droid torso & head deal for cusomizing use? I have them on my site and they are available for download for personal use. and any other skull decals anyone has or can find (Never a lack of skull uses ). I have tried looking for these, but I was unsucessful (The computer I am using is slow, even by dial-up standards) I have tried flickr, MOCPages and attempted brickshelf, but it was having errors. Any help would be helpful. Specifically, I'd like a series of mouths with different expressions in a digital image file. I want to be able to take a mouth, and chroma-key out the background so that I could apply them Robot Chicken-style to minifigs. I'd be using them in Final Cut to animate the mouths of minifigs in stop motion animation. Preferably I'd like them to be in the style of the recent minifig designs; that is to say very expressive and fitting in with the current style. Again, I am just looking for the mouths. 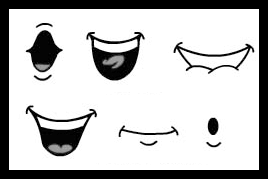 I'd like to have expressions, in addition to various levels of open to animate speech. My skills are lacking, and I'd like to have a step up from than drawing a black oval and pasting it over the mouth, or digitally manipulating a shape in post production. It would look something like this, but with a style closer to the minifig mouths being released now. Any help would be greatly appreciated. I really want to try this idea out, but lack the design skills to make them myself. Have them on my site already. Wow! Those are perfect. How did I miss those? It says unavailable for download. Would the $10 be for a physical decal sheet or for the digital image file? EDIT: Sorry about that, moved to PMs. Last edited by GIR3691 on Tue Jan 19, 2010 2:15 pm, edited 1 time in total. GIR3691 wrote: Wow! Those are perfect. How did I miss those? For the physical waterslide sheet. When you apply them, the white parts will appear because of Kam's magic printer. The clocks were striking thirteen..
Well the idea is that I would digitally place the mouths on the figures in post production, so I would need a digital file of the image. Ah. I see. Sorry, I got a bit muddled. I have a face decal request. It's a bit hard to make out. Also if you do include some of the bangs of hair, make it brown not red. Can I get this torso http://www.flickr.com/photos/masked-builder/4547367017/? Is there any way that you could make decals from the mario games? Like Mario from Super Mario Bros., Luigi? Thanks. Does anyone have or know where to find an extensive library of brick (not minifig) decal templates? Specifically, I am looking to decal two 2x4 tiles, two 1x8 tiles, and the side of two 2x4 bricks. I just picked up the Shuttle Adventure, but I want to make it more authentic-looking with some NASA decals. . .
Found some templates that I could work with to create the appropriate decals. Now I've printed out a couple of proof sheets, but it appears that I can't get my printer to print with high enough resolution to bring out all of the detail on my decals. Mostly what I'm missing are the stars on the NASA logo (used the "Color Insignia" on this page) and the stars on the smaller U.S. flags for the side panels. Would anyone be willing to help me out by printing these out on waterslide decal paper and shipping them to me at cost? I'd really appreciate an assist. Thanks!